The course comes with 6 video lessons (46 minutes) and a lead sheet. The step-by-step instructions show you how to play Over the Rainbow from The Wizard of Oz. 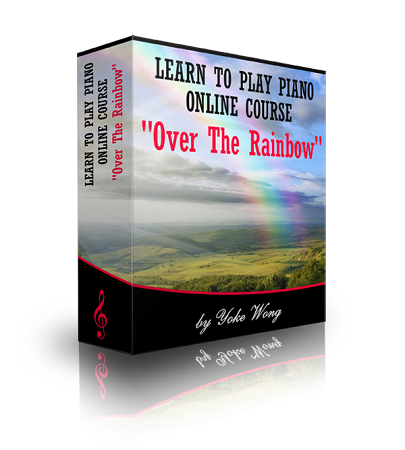 It is suitable for late beginners and intermediate players and those who would like to dress up and master the beautiful “Over the Rainbow” piano music. I am learning quite a lot from your courses, but I am not trying to be a great performer or anything like that. At my age I am just interested in keeping myself young by learning something new. I am enjoying your new lesson on Over the Rainbow. I am still having trouble with my left hand but gradually improving. I would not have reached this far if I had not found your Website. Thanks for giving on old man so much pleasure. I like this format of a one song at a time to work on ! The Lesson Over the Rainbow is very helpful and informative ! Thank you for your great teaching silks which are easy to follow ! I like this format of a one song at a time to work on ! I really loved learning all the different ways to add fills and styles and all. I was pleased with the arrangement I ended up with. In it you used what you called "Reverse Arpeggios" in the left hand as a fill and I really loved it.